Mannn that was a HELL of a good burger and fries ! If you're a meat lover, you have to take a double cheese burger tho, the patties aren't that big but for a good reason: there's always a bunch of a people at this place, but you never wait long to have your lunch. The poutine is good too ! But I'm a fries lover,and they were incredibly good ! Very good poutines .Service is rapid and friendly. In summer tables out side. It's situated between Quebec and Ontario. This is a busy spot. They serve fast fast and it's good. There is outdoor seating and the service is pretty fast. I enjoyed their burger and fries. 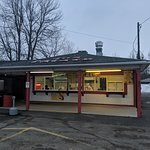 Driving along the hiway you might spot this place like I did and think you'd get authentic chip cart burgs and fries. You won't. It'll be garbage. The burgers were disgusting. The fries so soggy with old oil ... completely inedible. The Tim's up the road would be gourmet in comparison! Great fries and the price was fair! Stopped twice while visiting the area and enjoyed both of our small meals. Fries were fresh and delicious as was the toaste! Prices were fair service was pleasant, with a smile and quick! Worth a stop if you are driving by. Been to Jos Patate? Share your experiences!